In your Live Broadcasts of the type 'Production', 'Restream' or 'Capture', you have the option to redirect your flows to a decoder. 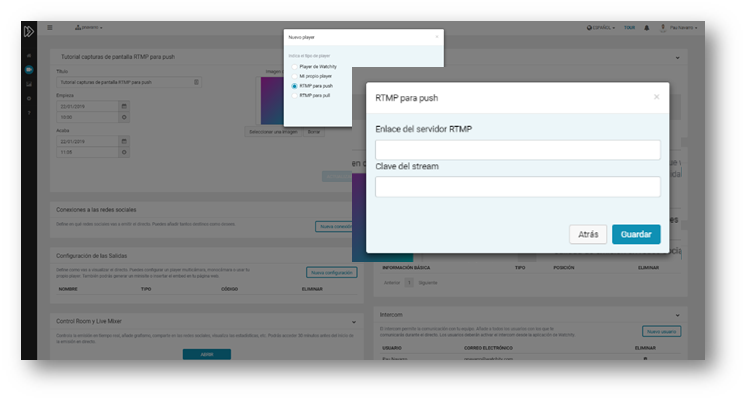 You can configure connections "RTMP for push" (the devices give you the codes that you must enter in Watchity), or "RTMP for pull" (Watchity provides the codes that you must enter in the decoders). 1(A). If you use a device capable of providing a destination address, in the configuration of your Live Broadcast in Watchity, add an "RTMP for push" output. Paste in Watchity the RTMP code and the transmission key obtained from your decoder. 1(B). If you use a device that only allows reading, in the configuration of your Live Broadcast in Watchity, add an "RTMP to pull" output. Paste the RTMP code and the transmission key obtained from Watchity into your decoder. 2. Once you start the transmission, you will begin to receive the content that is being distributed from Watchity.